Wild Nutrition’s Children`s Multi-Strain Biotic is a high strength unique complex of 8 microbiotic strains in an easy-to-use powder form, specifically selected to support your child’s natural digestive environment. This expertly formulated complex provides 8 strains of beneficial flora. Beneficial flora has a central role in the immune development of babies and infants. Babies acquire this flora during the birth process and breastfeeding, however Caesarean section, feeding with formula-milk, vaccinations and antibiotics can disrupt this sophisticated balance of gut bacteria. The Children`s Multi-Strain Biotic has been formulated to provide the key strains for digestive wellbeing in children at a therapeutic dose of 10 billion colony forming units (CFU). Provided in an easy to use powder without any unwanted extras such as maltodextrin or silicon dioxide, it can be added to milk or other cold or lukewarm liquids. For all year round and seasonal support. Lactobacillus casei, Lactobacillus rhamnosus, Streptococcus thermophilus, Bifidobacterium bifidum, Bifidobacterium infantis, Lactobacillus bulgaricus, Lactobacillus reuteri, Lactobacillus acidophilus and Vegetable Cellulose. Ages 0-5 use 1.5g (half level teaspoon). Ages 5-15 use 3g (1 level teaspoon). Mix powder with a small glass of water or juice once per day. Drink immediately, preferably on an empty stomach. 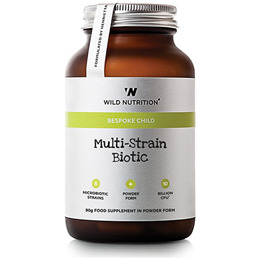 Below are reviews of Wild Nutrition Children`s Multi Strain Biotic - 90g by bodykind customers. If you have tried this product we'd love to hear what you think so please leave a review.